Last weekend we went down to the Willamette river in Newberg to watch my dad launch his boat. He built it himself, so we were all very excited when it supported at least three adults and one child without capsizing! Really, he did an amazing job and it was a beautiful piece of nautical craftsmanship. James and I played a little football while we waited for our turn (sadly, we didn't have any "size 5 months" life jackets, so Jamesy had to sit this one out). Julie and Daphne took a long walk down a slightly longer pier. Daphne was heard to say to herself slowly and somberly "Don't fall in, you get verrrry saaaad." Capitalizing on the gorgeous weather this morning, we took a walk around the neighborhood and then to the new school playground across from our house. P.S. Most of you are probably aware of this but in case you're not, you can click on the pictures to enlarge them and/or save them to your computer. We thought this picture was hilarious so we had to share it with you. And yes, we are fully aware of the size of James' noggin. He'll grow into it. And I included one more more because I feel it captures something about my life. If you were to ask me, "What is your day-to-day life like?" I would show you this picture. 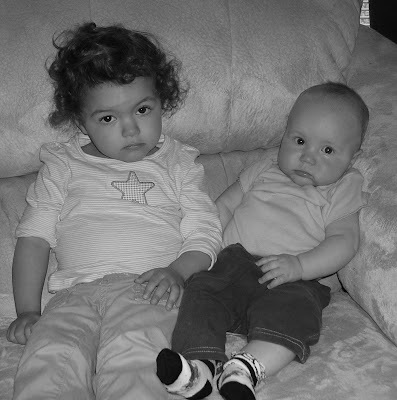 I get this look from my kids numerous times per day. They are saying to me, "Okay, Mom, what are we going to do next? And whatever it is, it'd better be good."